We planned a trip back to Florida and were able to have some Wine and Cheese time with Neil’s mom Linda. I thought she would enjoy a Viognier so when we found this blend we figured we’d give it a try. And who doesn’t like a tasty Brie? This wine was created using sémillon, moscato, chardonnay and viognier grapes. Neil and I could smell alcohol but we both identified other flavors in the Pandemonium blend. I noticed toasted burnt oak aromas and Neil found green apple aromas and flavors. Linda commented more on the texture of the wine describing it as smooth, not dry, and velvety. She liked it better than many other white wines that she’s had in the past. Neil agreed with the round flavor and I was reminded of a caramel apple. After we took our tasting notes, we all discussed the individual flavors that each grape in the blend might have. Linda realized that one of the flavors she tasted in the wine was the apricot flavor from the viognier grapes, pretty cool! We were all surprised that the wine wasn’t sweeter from the moscato and I’d say we all liked the texture from the chardonnay grapes and the oak. I’m not sure if we’ve ever had a Sémillon wine, perhaps we can find one when we get back to California. Now onto the Brie, we all tasted a creamy, buttery, salty flavor. I found it to be tangy, Neil noticed a mild flavor and Linda said it was “yummy”. I’d say we all felt this way, because we ate all the cheese without even realizing it. 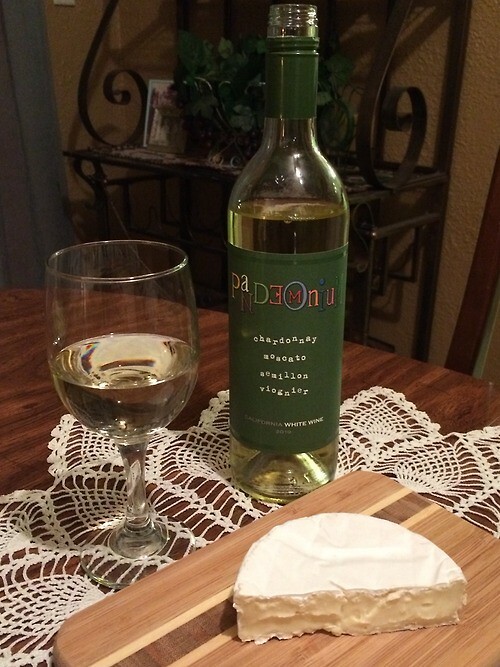 As we paired the Pandemonium White Blend and Double Cream Brie, Linda identified a walnut flavor. This was the first time she ever had a new flavor appear from a wine and cheese pairing so she was pretty excited! It was interesting to watch so I almost missed the nutty flavor during the pairing. The wine did bring out a little bit of funk after the cheese, as well. Neil found the flavor to be closer to pistachio and said the wine was more tart on his tongue. What an interesting pairing!